Randy is a native of Wichita, Kansas. He's been burning up stages for more than 30 years with his charismatic voice and intense, journeyman approach to his instrument. He has spent much of his life playing music on the road, performing with Jack Mack and the Heart Attack, The Boxtops, and opening for many notable acts including the Neville Brothers, Rare Earth, Average White Band, Etta James, and many more. Randy also spent 10 years in Los Angeles doing sessions and sideman work. Never the type to be stuck in a musical rut, he has played many different styles. His voice can be heard on many film and television scores. Jeff Nicely has over 35 years of lively performance experience. Jeff enjoyed the early influences of a musical household with varied tastes – from the requisite childhood piano lessons to watching his older brothers’ rock ’n roll bands rehearse in the front room while opera played on the stereo for the parents in the kitchen. While the blues has long been his base, Jeff also plays jazz, rock, gospel, folk, hip-hop, country, reggae, bluegrass and more. He’s performed with some of the best during his harmonica travels, from loose pickin’ parties to tight funk ‘n soul shows. 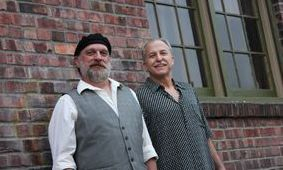 His band Blues Playground was a 2011 Washington Blues Society Best of the Blues Nominee for Best New Band. 2012, 2013, 2014, 2015, 2016, 2017 Washington Blues Society Best of the Blues Nominee for Solo/Duo Act - WINNER 2017 BB AWARD! !